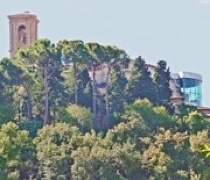 According to tradition, the first Franciscan community of Perugia was established by St Francis himself, in 1212, on a site that later became the nunnery of San Francesco delle Donne (see below). Whatever is the precise truth of this claim, it is clear that a Franciscan convent was established on that site early in the 13th century. It was some way outside the city walls, and the friars soon made plans to move to a more central location. ✴the monks the Eremo di Fonte Avellana, outside Gubbio, who owned the adjoining church of San Matteo in Campo d' Orto. In 1253, the Franciscans sold their original convent to a community of Benedictine nuns (hence that church’s later appellation “San Francesco delle Donne”), and it seems likely that this was the point at which they finally moved to Campo d’ Orto. They probably bought San Matteo at this time for their own use. A persistent tradition has Innocent IV laying the foundation stone of the new church: if this is correct, it probably occurred in ca. 1253. The church must have been in use by 1256, the year in which Pope Alexander IV issued indulgences to those worshipping there on the feast days of SS Francis, Clare and Antony of Padua. This must have helped to finance an impressive series of artistic commissions, many of which were inspired by developments at San Francesco, Assisi. The Blessed Giles, one of the first companions of St Francis in Assisi, died in 1262 in his hermitage near the convent. His relics were brought to San Francesco and venerated in a shrine that seems to have constituted an important cult site. 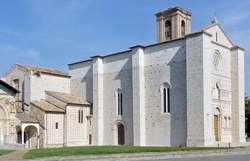 The history of this site is set out on the page San Francesco al Prato: Relics of Blessed Giles. Giacomo di Boncorte Coppoli gave the land on which the Blessed Giles had had his hermitage to the friars in 1276. A convent (the Convento di Monteripido) was documented there in 1290 and a church in 1310. The church and convent were built on a site that was initially outside the city walls. However, they lay just within the new circuit that was completed in the early 14th century. This photograph, which is taken from Viale Orazio Antinori, shows the convent above this second circuit of walls. ✴In 1300, the leading citizens of Perugia assembled in the cloister of the convent to take the momentous decision to build a new Duomo. ✴When the Templars at San Bevignate were accused of heresy in 1307, the friars were appointed to act as Inquisitors. ✴The convent hosted the a number of General Chapters of the Franciscan Order, including that of 1322 during which it issued the statement on the absolute poverty of Christ that led to its excommunication by Pope John XXII. The Minister General transferred the Convento di Monteripido to the new Observant wing of the order in 1374. Unfortunately, the church of San Francesco al Prato suffered from structural problems from its inception, mainly because of the presence of underground streams. Four chapels were built in the late 14th and early 15th centuries, one at each of the external angles of the crossing, probably in an attempt to stabilise the structure. One of these (the Cappella di San Matteo, between the right transept and the right wall of the nave) originally belonged to the Michelotti family, and Biordo Michelotti was probably buried in it after his murder in 1398. (For more details, see the page on Art from the Exterior Chapels). A community of female Franciscan tertiaries that had established a nunnery at Santa Maria di Valfabbrica, near San Francesco al Prato, in 1383 established an off-shoot community at Sant’ Agnese in 1429. The sisters later concentrated at Sant’ Agnese, and the site of Santa Maria di Valfabbrica was used for the cemetery of the Convento di San Francesco al Prato. As noted above, the originally free-standing monument to Blessed Giles constituted an important cult site in the left transept. In 1439, Bishop Giovanni Andrea Baglioni put in hand a renovation of the shrine, probably as part of a conscious revival of the cult. ✴In 1445, shortly after the death of Fra. Bernardino of Siena and before his canonisation, Fra Angelo hosted another important Spiritual Franciscan, Blessed James of the Marches, who prompted the formation of the Confraternita dei Santi Girolamo, Francesco e Bernardino. The confraternity was given the perpetual use of an oratory in the convent (the Oratorio dei SS Girolamo, Francesco e Bernardino) in 1450. ✴In 1451, he commissioned the Oratorio di San Bernardino on land adjacent to the church. ✴In 1453, he hosted the annual meeting of the General Chapter of the Order, during which he officiated at a celebration of the feast of St Bernardino attended by the delegates and by the leading citizens of Perugia. ✴The Gonfalone di San Francesco (left), which was originally in the Cappella del Gonfalone (see below), contains an interesting view of the the apse of San Francesco and its campanile: the latter was built in 1455 by Bartolomeo di Mattiolo but rebuilt in 1748 (see below). The group of flagellants to the left probably belonged to the Confraternita di San Francesco. ✴The Gonfalone di San Bernardino (right) shows part of the facade of San Francesco (which was still incomplete), the left side of the church, the left transept and the campanile. This image provided important evidence for the original appearance of its facade that facilitated its restoration in 1926 (see below). The Commune commissioned the Gonfalone di San Francesco mentioned above during an outbreak of plague in 1464. It became the centre of a cult when it appeared to have miraculous powers that brought an end to the outbreak. 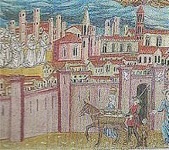 The Commune sent ambassadors to the newly elected Pope Paul II to seek (among other things) the granting of an indulgence for those attending further processions of the banner during outbreaks of disease. The Franciscans were closely associated with these moves, following which they instituted a lay confraternity to oversee the development of the cult. This confraternity built a chapel to house the banner against the facade of San Francesco, which was known as the Cappella del Gonfalone or alternatively as the Cappella di Santa Maria della Pace. The banner (which is described in the page on Art from the Exterior Chapels) was again used in processions during outbreaks of plague in 1476, 1486, 1527, 1539 and 1587. The chapel was remodelled in the Baroque style in 1646, closed in 1909 and demolished in in 1926 to facilitate the rebuilding of the facade (see below). The early 16th century was a period of splendour for the church, in which it attracted the patronage of the major families of Perugia. After taking Perugia in 1506, Pope Julius II (who had studied and been ordained as a priest herein the late 1460s) celebrated a mass here before leaving, at which he formally reconciled the wrring factions. He seems to have commissioned some works of restoration in the convent. ✴Guido degli Oddi acquired the double chapel at the external angle between the left transept and the left wall of the nave (illustrated here) in 1461, from which point it was known as the Cappella degli Oddi. This was the original location of Raphael's Pala Oddi (ca. 1503). ✴Atlanta Baglioni acquired the Cappella di San Matteo opposite in 1499 and was buried there in 1509. This was the original location of Raphael's Pala Baglioni (1507). These important altarpieces are described in the page in the page on Art from the Exterior Chapels. Unfortunately, this felicitous period was soon to end. The church suffered serious damage during flooding in the early 1520s, and was left in a poor state of repair until 1527, when funds were finally raised for repairs. The high altar was moved to a new location closer to the apse in ca. 1532 and re-consecrated in 1536. ✴the reconstruction of the campanile. The sacristy was rebuilt in 1751. ✴another in the bay to the right of it that was probably the main entrance to the church. Francesco Moretti, whose stained glass laboratory was housed in the ex-convent from 1874 until 1895 (when it moved to what is now Casa Moretti-Caselli), made an important drawing of original appearance of the facade, basing it on an examination of what then survived and also on the depiction of the church on the Gonfalone di San Bernardino mentioned above. ✴Ugo Tarchi began the restoration of the Cappella degli Oddi (above) in 1921. The Gonfalone di San Bernardino was moved to this chapel in 1923, an entrance to it from the piazza was opened and it was re-opened for religious services in 1929. ✴The Cappella del Gonfalone was demolished to facilitate the restoration of the facade in 1926 (as one of the events that marked the 500th anniversary of the death of St Francis). the drawing by Francesco Moretti mentioned above informed this restoration. The Franciscans returned to San Francesco in 1932, and adapted the sacristy of the church for their religious services. However, they lacked the means to restore the church, which continued to deteriorate. The Commune re-acquired it in 1968 and finally stabilised it in 1977-80. From this point, the church was used as an auditorium and the convent housed the Museo dell’ Accademia di Belle Arti (below). ✴The facade has now re-emerged from the scaffolding. ✴The interior of the church (photographed on the left in 2006) has been reduced to a shell that is being converted to form an auditorium. ✴The apse has been encased in perspex (photographed on the right in 2013). ✴The Museo dell’ Accademia di Belle Arti re-opened in 2012.